10 realities to consider before bringing your horses home. 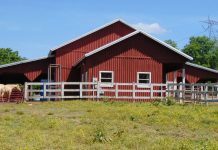 Most horse owners have a pastoral dream of living on a farm where they can look out the kitchen window while holding their morning coffee and see their horses grazing peacefully in a lush pasture. What they don’t realize is that horse property owners spend most of their time at home doing chores, not looking out windows. Plus, by the time chores are done, riding a horse seems like too much work. This is such a universal refrain from exhausted farm owners that it should be emblazoned on a T-shirt. Are there any redeeming reasons to keep your horse at home? Sure. Scores of horse owners would never move off their farms; the work and daily proximity to their horses is a cherished lifestyle. However, the reality of horse ownership for most people can be summed up best by this adage: if you want to actually ride, board your horse. 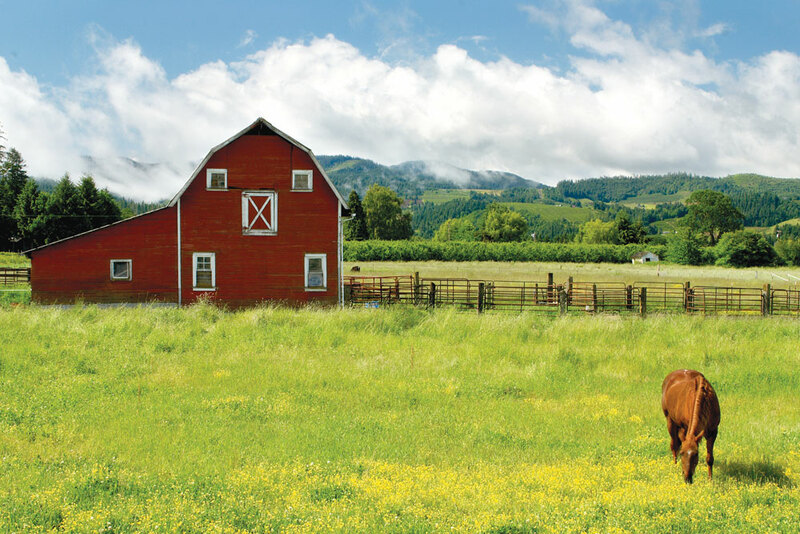 Here are 10 realities to ponder before buying that acreage and moving your horse home. It’s difficult—if not impossible—to take vacations when you have twice-a-day, 365-day-a-year chores. (Ask any dairy farmer how often he goes on vacation.) 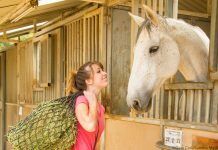 If you’re fortunate, you’ll find a dependable horse-sitter, but paying the person is an added expense, and you never stop worrying that something might go wrong while you’re away. This farm-bound lifestyle can create considerable conflict if you have a non-horsey partner. For some horse owners, riding isn’t as important as spending time with the horses. 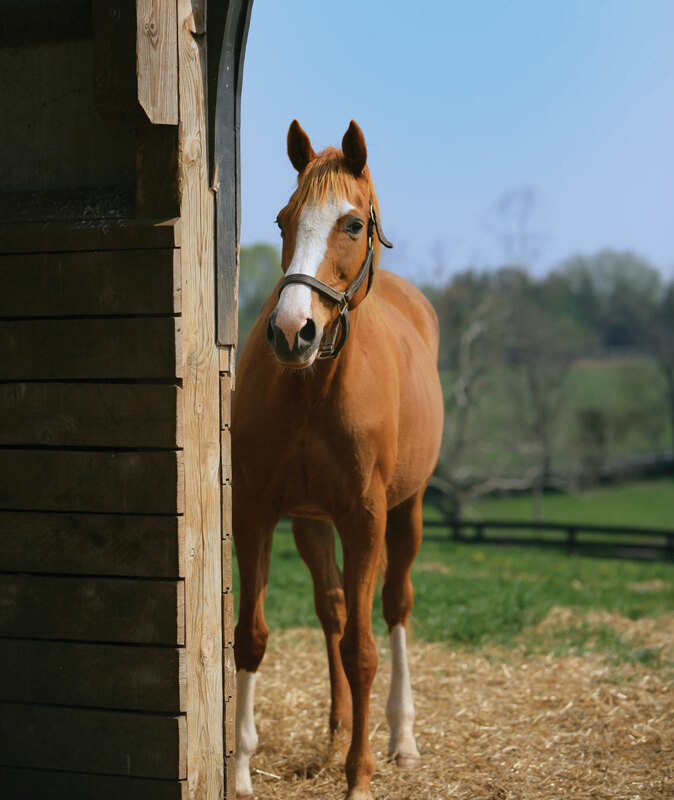 If you adore watching your horses inhale feed and wander in and out of the barn, then keeping them at home might be great. Be prepared to spend a lot of time alone in a stall with a pitchfork. Or alternatively, watching your horses graze while you annihilate Canadian thistles. When your horses are at home, you have responsibility for virtually every aspect of their care and surroundings. If your electric fence shorts, you have to fix it. If your water line freezes, a gate is left open and your herd takes off down the road, your tractor is in a ditch, snow has blocked your barn door, or a 4’x8′ piece of plywood needs moved, you often must tackle it alone. On the plus side, you will become creative, learn to appreciate leverage, and build muscle. You must maintain a daily supply of all horse feed, bedding and hay. You will need a vehicle with enough square footage to transport the above. Trips to the nearest farm supply store will occupy you way more than time in the saddle. The most onerous and enduring task on your farm is manure disposal. Options are often limited by neighbors and finances. You can create a temporary pile to remove periodically by farm equipment, but manure piles are often the catalyst for neighborly squabbles about smell, flies, and unsightliness. Even if you spread manure on your fields, an environmentally conscious and responsible management practice, you may generate wrinkled noses and cranky neighbors. A few waste disposal companies provide a dumpster for manure removal and weekly pick up, but if they charge by weight, cost can be prohibitive. To ensure your horses have quality forage, you must educate yourself about pasture management. This includes soil quality, fertilizer type and timing of application, mowing for premium plant growth, weed control, identification of toxic plants, and stock rotation for optimum regrowth. You’ll follow weather forecasts the way investors follow the stock market. You may end up with a forklift, small tractor with an end loader, harrow (tined drag for smoothing arena dirt or breaking up manure piles in the pasture), pull-behind seed spreader, weed sprayer, riding lawn mower and bale elevator. Be sure to budget for what you’ll need to keep up the property. If you’ve had the privilege of riding in an indoor arena, you will miss it, even though it used to seem monotonous. Most horse owners cannot afford to put up an indoor arena and also pay increased property taxes upon reassessment. If your horse is sick, injured, or colicky, the number of experienced people at a public stable at all hours of the day and night is a bonus. Most barn regulars can spot unusual behavior in a horse they see every day, even when it’s not theirs. Horse owners who are used to riding with friends will have an especially difficult time adjusting to solitary riding. You can be an avowed loner, yet find your favorite memories on horseback involved other riders. The camaraderie of shared experience is a powerful human connection—ask any military veteran. In spite of all of the above, owning a horse property and watching your horses graze, play, and (in my case) shake pear trees to cause a veritable storm of falling fruit, is more than enough compensation for what you give up. Millions of people agree. I love a lot of the articles I read on Horse Illustrated but I will admit this one bothered me. I have five horses that we rescued over the last year. Three from kill pens up north and 2 from the boarding barn we currently board at. We do 100% self care because quite frankly, We couldn’t stand it any other way. What bothers me about this article is the implication that horse owners should look for the “easy” way out to avoid feeling trapped. We have put our heart and soul into these boys, helping them go from neglected, abused, frightened horses with dead eyes to five of the sweetest, funniest, and most playful horses I’ve been around in some time. We didn’t rescue them to have someone else take care of them, not even to feed them a bucket of grain. We want to be the one that checks over each and every one of them when we bring them in after being in the pasture or when we arrive in the morning after a night of being away from them. We love being able to figure out what each one of them needs at any given time and be the ones to provide it. We know them inside and out, literally, and to leave that care to someone else is unthinkable to me. We did have to go away once for a couple of days over the almost year we have had them and hired someone to come care for them and they did fine but we were able to tell her the specifics about each one and that made it easier for her as well as easier for them because the care was consistent. It was very difficult to be away from them, but we handled it. Obsessive? Maybe, but CARING for these incredible animals is part of the joy of having them. We have bonded with each and every one of them. Our goal IS to have a property where the horses ARE right out our kitchen window. We are well aware of the responsibilities and maintenance required but again, this is part of owning these wonderful boys. We make repairs around the barn we board at NOW so having this responsibility at our own place would be a pleasure. To ME, “owning” a horse is not about having the barn hands take care of them so I can show up, run a brush over them, tack up and ride and that’s it. It’s about staying there for hours one night because one of them wasn’t acting quite right and I wanted to be sure he was ok. It’s about coming up with the perfect feeding regimen for our newest rescue that desperately needed weight and watching the jutting ribs and low top line improve steadily and seeing the light that is starting to show in his eyes. And it’s about coming into the barn and seeing five bright eyed beautiful boys excited to see us and them knowing that with all they’ve been through, their people have arrived to feed them, love on them, and protect them. Feel tied down? We’ve been out to that boarding barn twice a day, EVERY day except for those two days we were gone watching our son become a Marine. Not once have I felt tied down. Am I the perfect horse owner? Of course not and I’m not trying to imply that I am… but to me these boys are not “just animals” they are part of our family so everything that goes into caring for them is just more things I can enjoy and look forward to. I notice you say “we” a lot. I own 4 that I care for all by myself. I’ve been out in the barn with 104 fever, a broken arm, broken vertebrae and traumatic brain injury (all but the fever caused by one of the little darlings). What I would have given to have been part of a “we”. Even just having one other person to throw grain occasionally would be a relief. This is an excellent article for anyone doing it by themselves. These are all the things to take into consideration. But like you, I wouldn’t have it any other way.